This month has been so busy and I completely forgot about the Daring Baker's Challenge until today when I was checking my email etc. and I noticed the date and realized the Daring Baker's Challenge had to be posted! I didn't want to miss the deadline, so I scrambled.... and raced into the kitchen to get started. After reading comments from my fellow Daring Bakers like " Allow 3 days to create this" I panicked .... YIKES!!!!! Needless to say, I completed it. When the instructions said to leave it in the refrigerator overnight, I left it in for only for a few hours, so I am sure that the Mascarpone cheese would have firmed up more, although I must say I thought it was fine. It IS possible to make this in one day! I did have help from my step-daughter Meredith ....Thank you Meredith!!!!!! 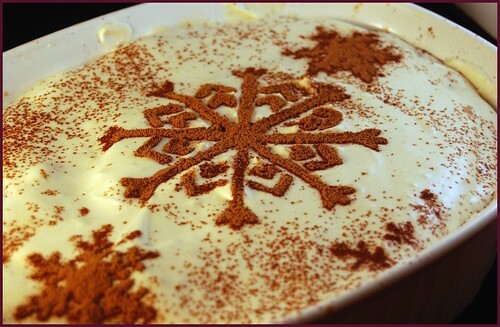 By the way, I had a stencil of a snowflake so I sprinkled the Cocoa on it and voila! It worked out quite well. Way to go on making it! I haven't done it ... too busy! Love the snowflake!